Who invented the Stethoscope? The name of the person credited with inventing the Stethoscope is Rene Laennec (1781 - 1826). Rene Laennec is not only famous as the French inventor of the Stethoscope but also as a physician. Laennec is often referred to as the "Father of thoracic medicine". When was the Stethoscope invented? Rene Laennec invented the Stethoscope in 1816, during the Industrial Revolution period of invention (1700 - 1860). The invention of the Stethoscope originated in France and enabled physicians to obtain vital clues to a patient's condition. Definition of the Stethoscope: The Stethoscope is defined as a medical instrument for listening to the sounds generated inside the chest, such as the heart, chest and lungs, by conveying the sounds produced in the thorax to the ear of the examiner. 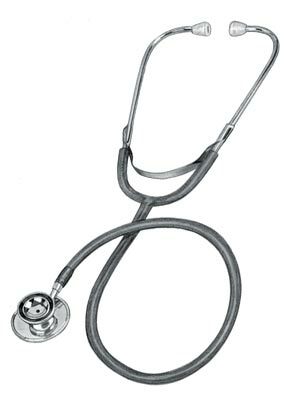 Parts of the Stethoscope: The parts of a stethoscope include two ear pieces on the headset, the chest piece, ear tubes, stem, tubing, and tunable diaphragm. The headset is the part that fits into the physician's ears, whilst the chest piece is the part of the stethoscope that is placed directly on the patient. Fact 1: Who invented the Stethoscope? The Stethoscope was invented by Rene Laennec in 1816 during the Industrial Revolution era of inventions (1700 - 1860). Fact 2: Who invented the Stethoscope? Prior to the invention of the Stethoscope in 1816, physicians had no alternative but to listen with the ear. There was no method available to amplify the sounds heard, and low body sounds were often missed and vital clues to the patient's condition therefore ignored. Fact 3: Who invented the Stethoscope? The early forms of detecting chest sounds were known as percussion and auscultation, the methods used as an aid to diagnosis and treatment. Fact 4: Who invented the Stethoscope? Percussion was the technique of tapping the surface of a body part to learn the condition of the parts beneath by the resulting sound. Fact 5: Who invented the Stethoscope? Auscultation referred to the act of listening to sounds arising within organs, such as the lungs or heart. The problem was solved when the stethoscope was invented. Fact 6: Who invented the Stethoscope? The inventor of the Stethoscope, Rene Laennec, was born on 17 February 1781 in Quimper, France and died on 13 August 1826. Fact 7: Who invented the Stethoscope? The early years of Rene-Theophile-Hyacinthe Laennec were spent in Quimper, Brittany France where he was raised by his family. His father's name was Theophile-Marie Laënnec, who worked as a civil servant. His mother's name was Michelle Felicite Guesdon who sadly died from tuberculosis when Rene Laennec was just six years old . Fact 7: Who invented the Stethoscope? The life of the Laennec family was shattered once again when the French Revolution (1787–1799) erupted. Rene Laennec was sent to live in the city of Nantes with his uncle, a noted physician called Guillaume-François Laennec, who was also the dean of medicine at the University of Nantes. Fact 6: Who invented the Stethoscope? Rene Laennec became interested in medicine and resolved to follow in his uncle's footsteps. He served as a medical cadet during the French Revolution and went on to finish his education at the University of Nantes and graduated in 1804. Following his education he gained experience as a physician working in Paris, learning medicine from other eminent doctors of the period. Fact 7: Who invented the Stethoscope? Rene Laennec gained an excellent reputation as a doctor. He was also a devoted Catholic and gained a prestigious appointment as personal physician to Cardinal Joseph Fesch (1763 - 1839), the uncle of Napoleon and French ambassador to the Vatican in Rome. Fact 8: Who invented the Stethoscope? From 1812 until the end of the Napoleonic Wars (1803–1815), Rene Laennec took charge of the Salpetriere Hospital in Paris, tending wounded soldiers. Fact 9: Who invented the Stethoscope? In 1816 Rene Laennec was appointed as physician at the Necker Hospital in Paris, where he invented the stethoscope. Fact 10: Who invented the Stethoscope? Rene Laennec was a devout and shy conservative and appreciated that women found it extremely embarrassing, and somewhat improper, for doctor's to rest their ear against their chest. Fact 11: Who invented the Stethoscope? It is said that Rene Laennec's invention was inspired by one such patient, who made such a fuss at being examined that Rene Laennec resorted to rolling up a manuscript of paper and applied one end the tube to her heart and the other end to his ear. Fact 12: Who invented the Stethoscope? Rene Laennec was surprised that listening to the patients heart with the tube produced clearer and more distinctive sounds than just placing his ear against the chest. Fact 13: Who invented the Stethoscope? Rene Laennec began to construct several hollow wooden prototype instruments attached to a single microphone at one end and earpiece at the other. Rene Laennec discovered that the length of tubing used in the stethoscope had a direct impact on the quality of sound heard. His designs became more sophisticated until he was happy with his invention. Fact 14: Who invented the Stethoscope? Rene Laennec coined the name 'Stethoscope' for his new medical instrument, taken from the Greek word "stethos" meaning 'chest' or 'breast' and the Greek word "skopos" meaning 'to observe'. Fact 15: Who invented the Stethoscope? Rene Laennec's stethoscope was monaural, meaning that only one ear was used for listening purposes. It was similar in appearance to a trumpet, but it was made of wood. It tubular shaped and the end was bell shaped. Fact 16: Who invented the Stethoscope? The bell shaped area of the device was placed directly on the patient's chest and designed so that the physician would place his ear on the other end. Fact 17: Who invented the Stethoscope? The invention of the Stethoscope in 1816 allowed Rene Laennec to listen to the sounds of the chest without the awkwardness of intimate, physical contact with a patient. Fact 18: Who invented the Stethoscope? The invention of the Stethoscope was a success and was used until 1851, when further improvements were made to his important medical instrument. Fact 19: Who invented the Stethoscope? Rene Laennec died of tuberculosis on 13 August 1826 at the age of just 45 years old. Rene Laennec called his invention of the monaural stethoscope as "the greatest legacy of my life." Fact 20: Who invented the Stethoscope? In 1851, Irish physician Arthur Leared (1822–1879) invented the first binaural stethoscope, in which the physician used both ears for listening. His binaural invention was displayed at the Great Exhibition in London in 1851. Fact 21: Who invented the Stethoscope? In 1852, a New York physician called George Cammann (1804 - 1863) perfected the current stethoscope design for commercial use and it is still in use today.